The ASPCA (American Society for the Prevention of Cruelty to Animals) announced today that it is working with the New York City Police Department (NYPD) to provide pet microchip scanners to every precinct in the city – 86 in all – including Housing Police Service Areas (PSAs). The effort is part of the ASPCA-NYPD Partnership, which is now entering its fifth year. Microchips are subcutaneous identification implants, roughly the size of a grain of rice, used most commonly in cats and dogs. Each implant contains a unique serial number which can be read by a scanner and matched to a database containing the owner’s contact information. The scanners can help NYPD officers responding to suspected animal cruelty cases quickly obtain crucial animal ownership information, facilitating their investigations. For example, in the 2016 case of a dog in a suitcase found in a dumpster, information from a microchip pointed the NYPD Animal Cruelty Investigation Squad in the direction of those responsible, leading to a successful outcome in the case. On Saturday, February 10, more than 250 officers attended a microchip scanner demonstration during a seminar held at the Police Academy in College Point, Queens. 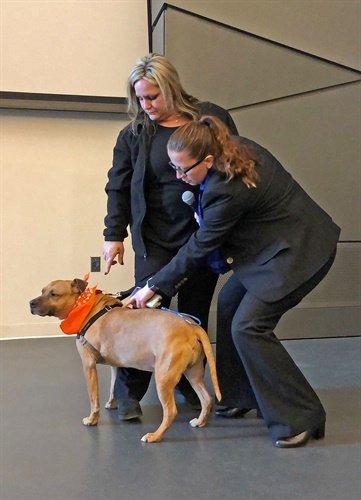 The seminars, held periodically throughout the year and conducted by ASPCA and NYPD experts, provide instruction on a variety of topics including NYPD animal cruelty investigation procedures, animal cruelty laws, blood sports, forensic investigations, and the ASPCA Community Engagement program. Since the beginning of the ASPCA/NYPD partnership in 2014, more than 2,500 officers have completed an animal cruelty investigations seminar. The citywide ASPCA/NYPD partnership originally launched in January 2014, and since then has treated more than 2,500 animals. Through this collaboration, the NYPD takes the lead role in responding to all animal cruelty complaints in the five boroughs, and the ASPCA provides direct care for the victims, as well as training, veterinary forensic, and legal support for the NYPD.